Leslie Perri – The Future is Female! 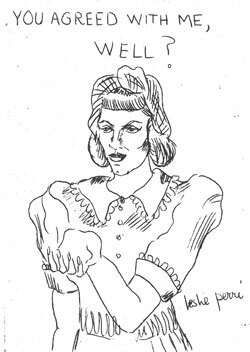 A sketch by Leslie Perri, perhaps a self-portrait, from “In Your Teeth ‘Gentlemen’,” a fanzine published after the first Worldcon in New York, July 1939. Leslie Perri (April 27, 1920–January 31, 1970) was born Doris Marie Claire (“Doë”) Baumgardt in Brooklyn, New York to German-immigrant bank manager Fritz Perri and housewife Marie Baumgardt. She joined the Science Fiction League and then the Futurian Society (whose members included Judith Merril, Virginia Kidd, Frederik Pohl, and Isaac Asimov) in New York while still a teenager. She attended the first Worldcon in 1939 and helped to circulate fanzines as a founding member of the Fantasy Amateur Press Association. During her brief first marriage (1940–42) to fellow Futurian Frederik Pohl, Perri edited (and reportedly largely wrote) the romance pulp Movie Love Stories. Later, she had a daughter by her second husband (1944–? ), the painter Thomas Owens, and a son by her third (1951–65), the former Futurian Richard Wilson. Baumgart took on the penname Leslie Perri when she began writing, illustrating, editing, and otherwise contributing to science fiction fandom in the late 1930s. She is credited as the author of numerous sketches and short items in fanzines including Future Art, Futurian News, Le Vombiteur Literaire, Mind of Man, Mutant, and Fantasy Fictioneer. 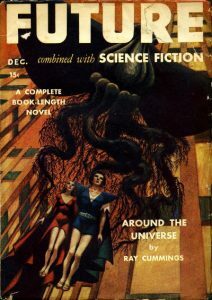 During this time, Perri also published three professional science fiction stories, the first of which was “Space Episode” for the December 1941 issue of Future Combined with Science Fiction. “Space Episode” provoked a great deal of controversy among readers with its depiction of a heroic female astronaut who sacrifices her life to save her male companions: predictably, women found the story compelling and realistic while male readers dismissed it as sour grapes (and editor Donald Wollheim happily fanned the flames of controversy). Moving from Brooklyn to New City, New York, Perri worked intermittently as a journalist while raising her children. She died of cancer at forty-nine.